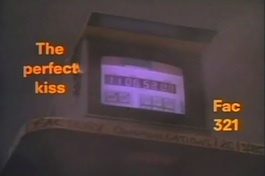 Notes: The (9:32) 'Perfect Kiss' video-clip as seen on FACT 225. Producer MICHAEL SHAMBERG: "The band didn't mime to songs, so we recorded the song live on 24-track. We brought D.P. Henri Alekan (cinematographer for Jean Cocteau's 'Beauty and the Beast') over to Manchester, shot in 35mm and edited with Tony Lawson (editor on Stanley Kubrick's 'Barry Lyndon', and many features by Nicolas Roeg) on a flatbed. Then we went to Liverpool to do a mix of the music and then traveled to L.A. to do a final film mix with Demme. It was like making a mini feature, and it cost about $200,000." Note that the number is the reverse of (FAC) 123 (i.e the 'Perfect Kiss' single).